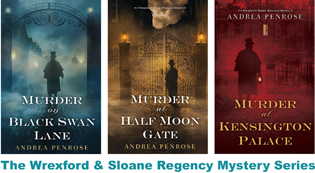 Regency-set mystery is now here! This fifth adventure takes Arianna and Saybrook to Brussels as the armies of Napoleon and Wellington are gathering. They seek to stop French treachery, but from the start, they find themselves up against diabolical deceptions, as old ghosts and new enemies appear from the shadows to test their mettle. And with the clock ticking, the success of their mission will once again come down to a matter of Luck . . . You can read an excerpt here! 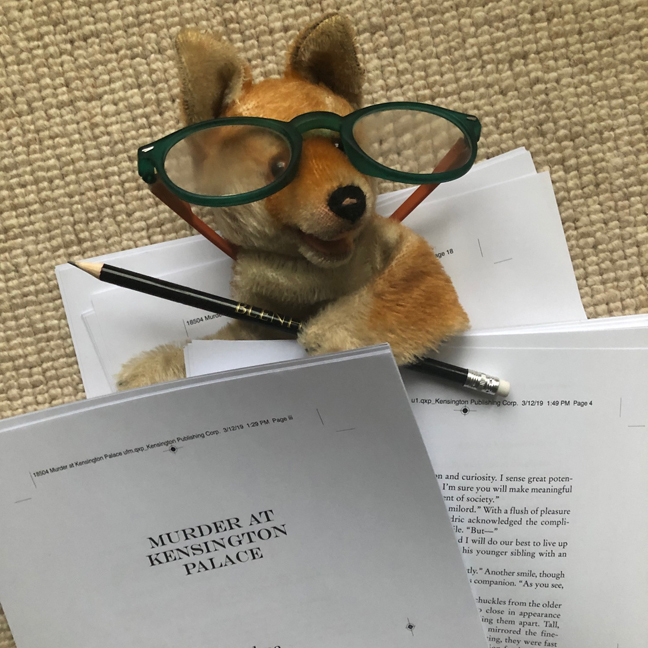 Be assured that my editorial assistant is hard at work proofreading the final galley pages for MURDER AT KENSINGTON PALACE, the third book in my Wrexford & Sloane historical mystery series. (Thank goodness Foxy has sharp eyes, a sharp pencil and is willing to work for chocolate!) The book is now available for pre-order! (It releases on September 24th.) You can read an excerpt here. 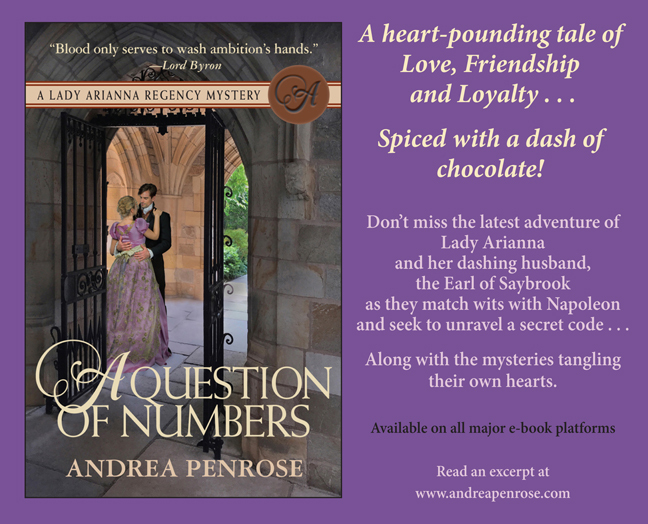 Wrexford and Sloane must unravel secrets within secrets—including a few that entangle their own hearts—when they reunite to solve a string of shocking murders that have horrified Regency London . . . 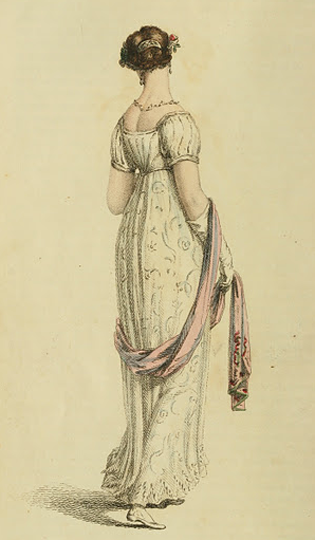 Though Charlotte Sloane’s secret identity as the controversial satirical cartoonist A.J. Quill is safe with the Earl of Wrexford, she’s ill prepared for the rippling effects sharing the truth about her background has cast over their relationship. She thought a bit of space might improve the situation. But when someone dear to her is murdered and his twin brother is accused of the gruesome crime, Charlotte immediately turns to Wrexford for help in proving the young man’s innocence. Though she finds the brooding scientist just as enigmatic and intense as ever, their partnership is now marked by an unfamiliar tension that seems to complicate every encounter. Despite this newfound complexity, Wrexford and Charlotte are determined to track down the real killer. 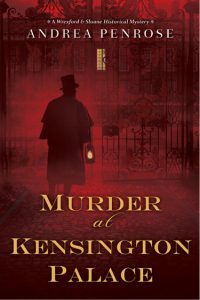 Their investigation leads them on a dangerous chase through Mayfair’s glittering ballrooms and opulent drawing rooms, where gossip and rumors swirl to confuse the facts. 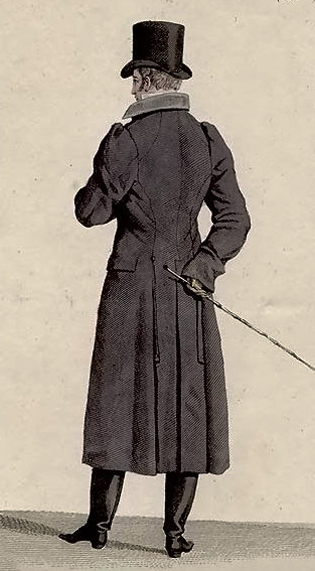 Was Chittenden murdered over a romantic rivalry . . . or staggering gambling debts? 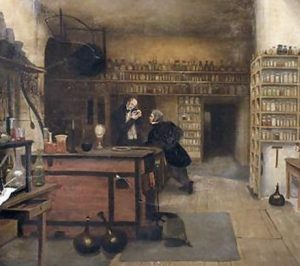 Or could the motive be far darker and involve the clandestine scientific society that claimed both brothers as members? The more Charlotte and Wrexford try to unknot the truth, the more tangled it becomes. But they must solve the case soon, before the killer’s madness seizes another victim . . .
From My Weekly Plotting . . .
I’ll also be posting a snippet each week from current WIPs, so be sure to check in often and take a peek! Not trusting her voice, Charlotte nodded in confirmation. Wrexford’s gaze turned searching. Probing, piercing to the very depth of her marrow. She looked down at her lap, despite knowing there was nowhere to hide. His fingers twined with hers. The connection, however small and fleeting, helped make her feel less alone in facing the challenges that lay ahead . . . 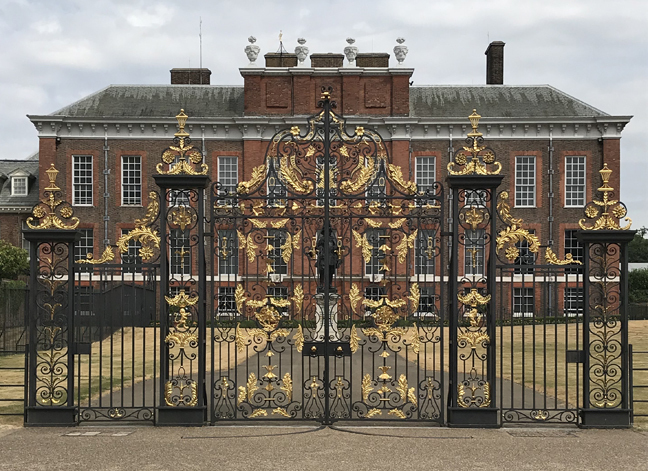 I was lucky enough to visit Kensington Palace during this past summer . . . You can read more about this fascinating royal residence by checking out the story under the “Diversions” tab on the navigation bar. I’ve also got other exciting books news! 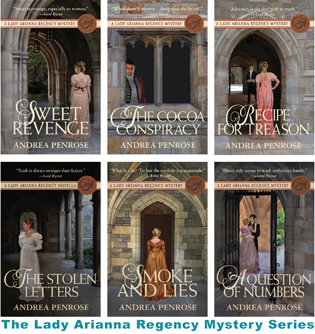 The first three Lady Arianna mysteries are now available in audiobook format. 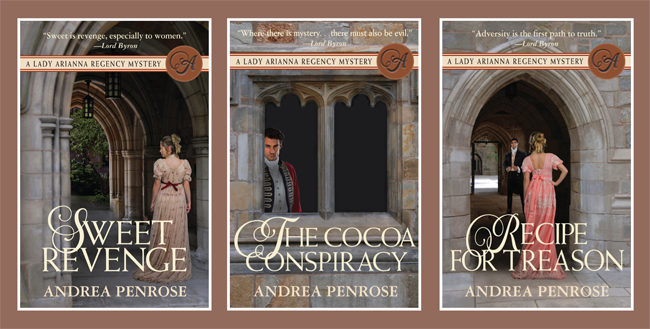 You can buy SWEET REVENGE, THE COCOA CONSPIRACY and RECIPE FOR TREASON by clicking on the titles, which will take you to the online sales site. Enjoy! I have an art background, which may seem like the polar opposite from the world of laboratories, microscopes and bubbling chemicals. I thought the same thing until I read a marvelous book called the Age of Wonder by Richard Holmes. 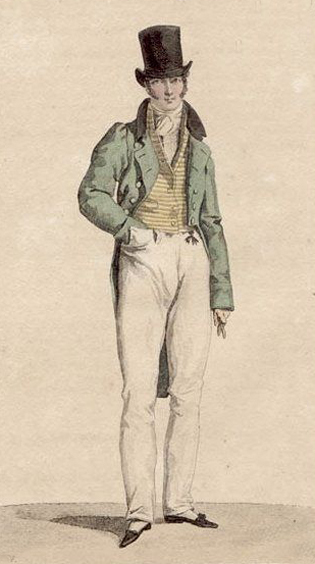 In it, he talks about how during the Regency era, the artists and scientists all thought of themselves as kindred souls. Exploration and discovery required imagination and creative thinking—painters, poets, chemists, astronomers—they all pushed themselves to think outside the box. 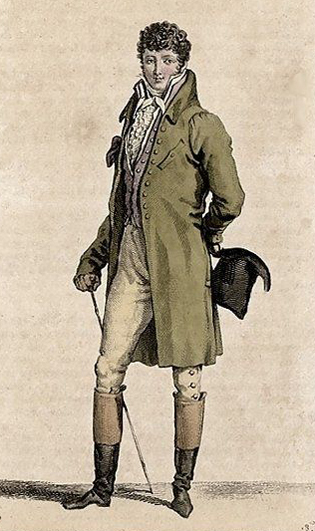 Okay, now I have a second confession to make—I may not be a science expert, but I’m a total Regency history geek. So it was great fun researching science during the era. 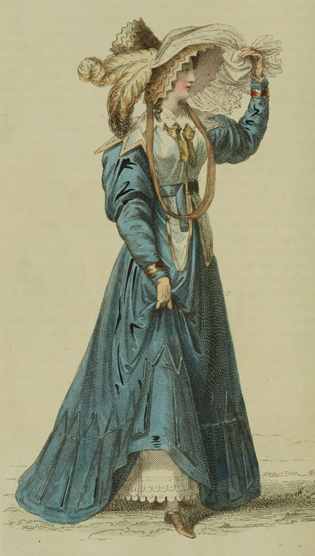 Like in our own times, new discoveries and new technology were changing society. The top scientists were the hot celebrities. All the trendy people flocked to heard the public lectures at the Royal Institution, the leading scientific society in London. And yes, there were science groupies! 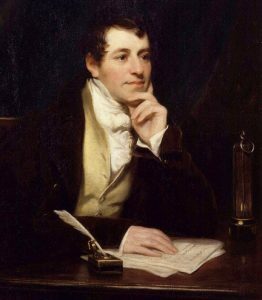 The charismatic Humphry Davy (he’s pretty dishy, isn’t he? 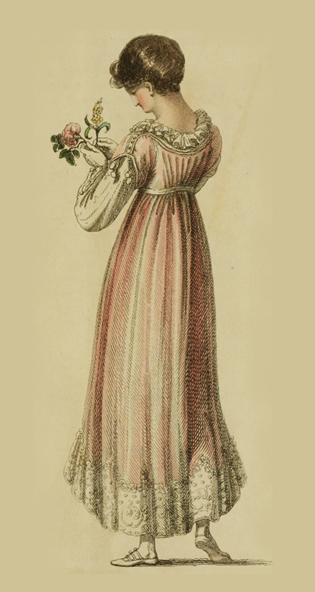 ), the most famous chemist of the day, routinely had love letters and invitations for private hanky-panky—often wrapped in frilly undergarments—delivered backstage! (There are several scenes in my book set at the Royal Institution—I hope they will forgive me for creating intrigue and skullduggery within their hallowed halls!) 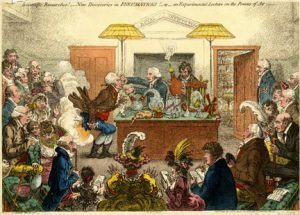 You can read more about some of the real-life scientists of the Regency in the “Diversions” section. Just click here. and some of the people and places who appear in my books. Just a few other things on logistics: The BLOG button in the social media icons will connect you to The Word Wenches, where Mary Jo Putney, Joanna Bourne, Susanna Kearsley, Patricia Rice, Anne Gracie, Nicola Cornick, Susan Fraser King and I blog about books, history, the craft of writing, and just about anything else you can think of! And in the BLOG section here on this website I’ll be musing occasionally on Writing and . . . any other Quirk of Life that strikes my fancy. And lastly, you can click on the links in the sidebar to connect to my other alter egos! 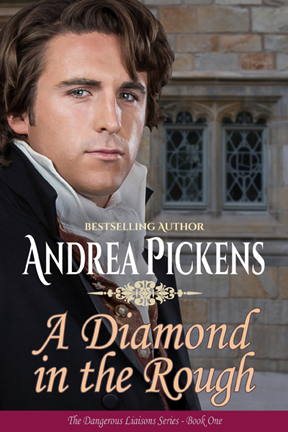 I write traditional Regency romances under the pen name of Andrea Pickens. 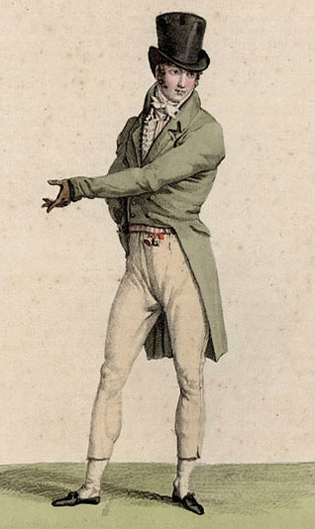 And I write Regency historical romances—which have more spice than the trads—as Cara Elliott. Have you ever wondered where authors get the inspiration for their heroes and heroines? Well, I have an art background, so I’m a very visual person and love to look at historical paintings to help me picture my characters. You can see other seductive men and alluring women on my Pinterest boards. Please check back often and say hi! This website is in compliance with new EU policies. Please know that it does not collect any data on visitors. 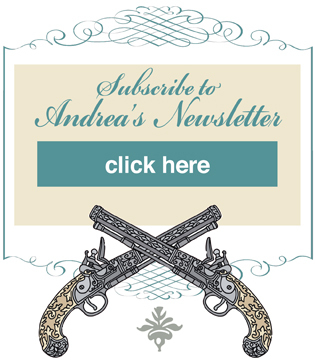 If you subscribe to my newsletter, you will receive an opt-in message to make sure you wish to subscribe. Your e-mail will then be stored with a listserver that promises compliances with all the latest regulations. It will never be shared with anyone else, and will only be used to send you my newsletters to alert you to new book releases, author news and special offers. Only your e-mail will be stored. You may unsubscribe at any time, and your e-mail will be permanently deleted.